A photo of Canada's beautiful scenery, including a lakeshore landscape, scenic snow-capped Canadian Rocky Mountains, and a blue sky. Large pine trees dot the shore of the lake. Arrive in Canada by car, train, or airplane. Fish, hike, bike, or just enjoy the scenery in Canada's great outdoors. Or enjoy Canada's culture, art, nightlife, and great restaurants in one of Canada's cities, such as Montreal, Toronto, or Vancouver. 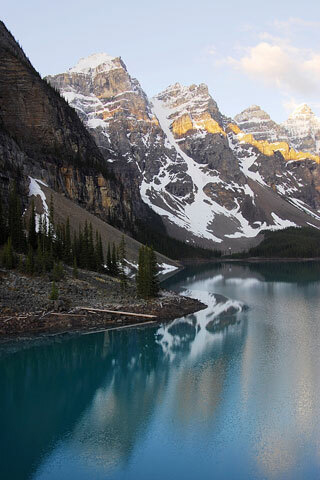 Alone or with families, on business or traveling for pleasure, Canada has plenty of wide open, natural spaces to explore, as well as exciting metropolitan areas. Both the French and English languages are used in Canada, although French is dominant in Quebec and English is widely spoken in most other areas. Map-Of-Canada.org. All rights reserved. About us.